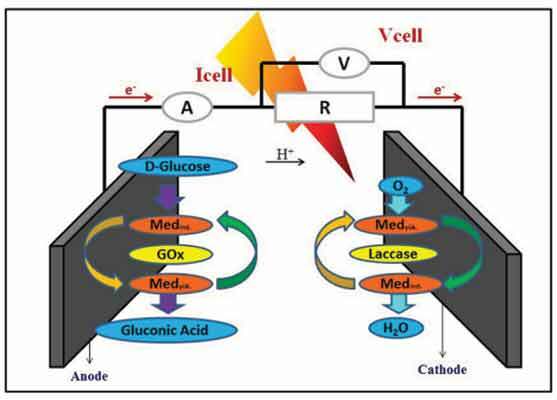 In this work, an enzymatic biofuel cell (BFC) was developed by combining nanomaterial modified and plain glassy carbon paste electrodes (GCPE). Because of the composite nature of GCPE, very practical and economic bio-anode and bio-cathode electrodes were formed. Bio-anode electrode was obtained by modification of composite GCPE with glucose oxidase (GOx) and gold nanoparticle (Au np). The effects of various nanomaterials like, aluminum titanate, manganese (IV) oxide nanoparticle and Fe3O4-Au bimetallic nanostructure on GCPE performance were also searched. pbenzoquinone mediator was used for the electron transfer between enzyme redox center and bio-anode electrode where glucose analyte was used as substrate. Optimization of experimental parameters (e.g. substrate concentration, mediator concentration, enzyme amount, temperature and pH) of bio-anode were carried out by linear sweep voltammetry. Laccase (Lac) modified plain GCPE was used as bio-cathode electrode. Then Au np modified GCPE and Lac modified GCPE were combined in a single cell and membraneless biofuel cell was obtained. The power density of single cell BFC was found as 6.7 μW cm-2 at a cell potential of 92 mV and current density of this system was obtained as 154.8 μA cm-2 in phosphate buffer solution. Mugla Sitki Kocman University, Faculty of Science, Chemistry Department, 48000-Kotekli Mugla TURKEY.